The WMMR-FM broadcast from the 7th September performance captures the charismatic partnership of Browne and Lindley at its strongest and in intimate surroundings such as the Main Point, it was rightfully celebrated and reflected in the buoyant mood of onlookers. The coffee house provided an intimate setting with its loyal inhabitants eager to sample what they could while it lasted as a financially viable venue. Browne and Lindley had agreed to perform six nights at the venue to help in saving it from closure due to poor financial constraints. The duo shared many light-hearted moments during these perform-ances with spontaneous outbursts of laughter and conversation shared equally. David Lindley's sharp sense of song and musicianship were primed for a solo spot where Browne could retire backstage allowing his counterpart to claim the audience's admiration. 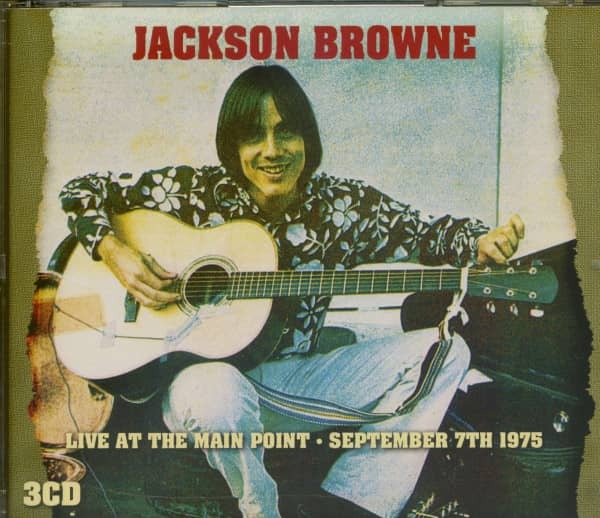 Klondike's retrospective spotlight on Jackson Browne's complete legendary performance from 1975 represents a valuable point in the artist's career in jt the comfortable surroundings of the Main Point. 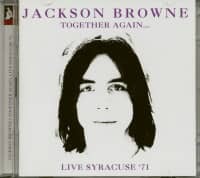 It's been predicted for a long time that Jackson Browne would be one of the big ones. I only know a scattering of his background, facts I gladly share with you. He might have been to Germany, but he definitely lived in Orange County, where he attended Buena Vista High School with a bunch of other people, some more famous than others. Timmy Buckley was his friend, so was Jimmy Fielder, Pam Polland, Greg Copeland, Steve Noonan, Patti Johnson. Many, many more. Timmy really was the famous one of the lot, and when he hit it big in New York, Jackson followed. New York at that time had an embryonic scene that revolved around the Dom. New York's finest, the Velvet Underground, pioneered their mixed-media experiments with Andy Warhol here (the Exploding Plastic Inevitable). Dylan would be in the audience some nights, and by the time Jackson arrived, the very beautiful Nico and David Rotor were the headliners. 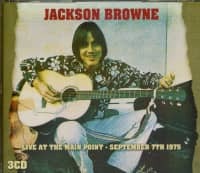 One of Jackson's fortes was that, even though he was playing an acoustic guitar, he had a rock'n'roll feel, and in addition, I loved his lyrics. Jackson joined up with the Dirt Band, who included some of his songs in their repertoire. On their second LP can be found one of the better early Browne tunes, Holding. Musical direction for the Dirt Band held something different than what Jackson sought, so his affiliation as an active member dissolved. However, they continue to work together on other levels. Maybe concurrent with Jack's departure from NGDB, or even after, he and Steve got involved with Jac Holzman of Elektra Records. I don't know the full story, but somewhere, somehow a demo record was cut. It's real good, it's got great songs on it and I only know of about three or four copies. Maybe now that Jackson is hitting it real big, Rubber Dubber will get active again. Steve sings on one side, Jack on three, and there's a hodge-podge of tunes from them and Greg too. Steve went into the studio first, produced a dynamite album, fought constantly with Jac and his crew, and split. 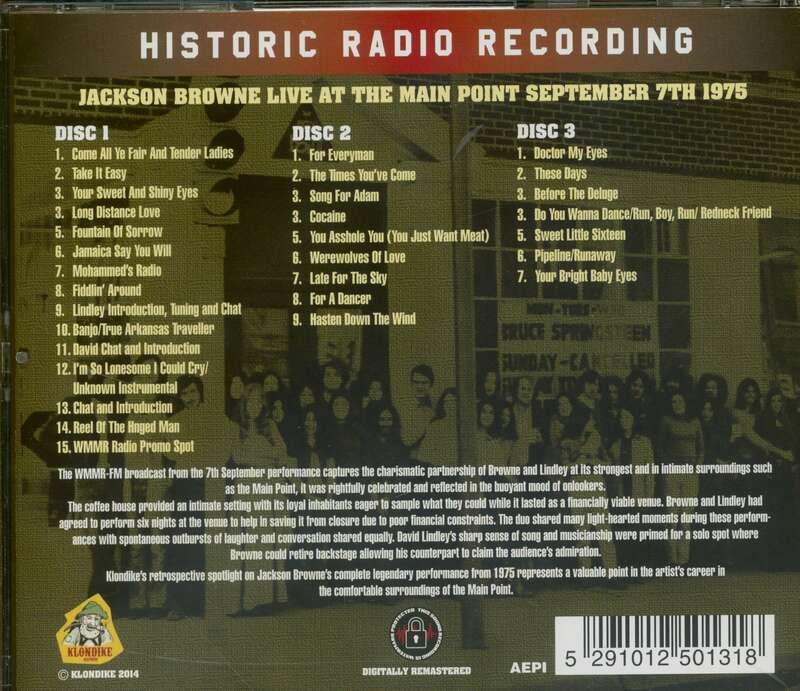 Customer evaluation for "Live at the Main Point - September 7th 1975 (3-CD)"